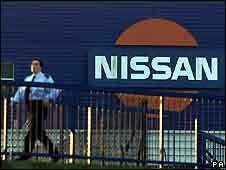 Carmaker Nissan is to build a new model at its Sunderland plant, securing jobs at the site which employs 4,700 people. The car, an addition to the Nissan range, will use the free plant capacity created when production of the current version of the Micra ends in 2010. The firm announced the £55m investment, £6.2m of which is coming from the UK government, as Prime Minister Gordon Brown visited its London design centre. The compact car will compete in the same market niche as the current Micra. Production of the next Micra will move to a new factory in Chennai, India, being built with partner Renault. In the last fiscal year, the North East plant built a record 374,000 cars. It is the UK's largest car exporter, selling four-fifths of its cars abroad. Nissan chief executive Carlos Ghosn said: "By delivering on tough commitments, our employees at Sunderland have demonstrated our plant can be a globally competitive centre for the production of high-value products." Speaking at the firm's European design centre, Mr Brown said the move would guarantee jobs and bolster the UK's manufacturing sector. "I'm delighted to congratulate Nissan on this new model, which will bring to Sunderland something that's going to guarantee jobs in the distant future." The Unite union said the decision would safeguard over 1,200 jobs "at a time when Nissan will move production of the Micra to India". "This proves once again that given the opportunity the UK can remain a strong manufacturing base for the world's top producers." The North East Chamber of Commerce (NECC) also hailed the decision. Chief executive James Ramsbotham said: "This is excellent news for manufacturing in the North East and Nissan's success is testament to the skill, flexibility and versatility of its workforce and the wider supply chain. "The fact that Nissan has retained such a competitive edge in an increasingly competitive industry demonstrates that manufacturing in Britain can be cost-effective while delivering a quality product that is superior to cheaper alternatives manufactured abroad." 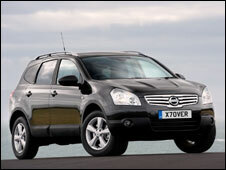 Analysts welcomed the move but said it did not herald an influx of new models likely to be built in the UK. "It is encouraging but ultimately the costs of manufacturing in UK are very high, particularly compared to emerging markets," said David Scott, from stockbrokers Redmayne Bentley.